Venue: Stadio Olimpico, Rome Date: Weds, 27 May Kick-off: 1945 BST Coverage: Live on ITV1 and Sky Sports 1, BBC Radio Five Live, BBC Radio Manchester; BBC Sport website. 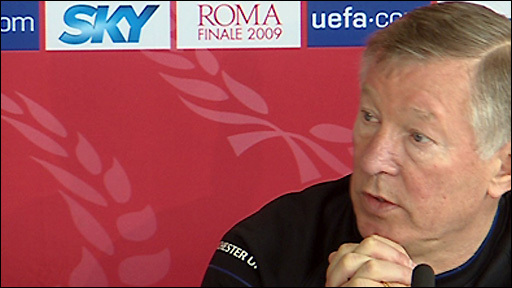 Sir Alex Ferguson says his quest for European glory is driven by a desire to prove he is not too old for the job. If Manchester United beat Barcelona in Wednesday's Champions League final Ferguson will become only the second manager to win three European Cups. "Each success brings more expectation," said the 67-year-old United boss. "Then I'm waiting for that kick in the teeth - a headline saying, 'Ferguson's finished, they're getting the bath chair out for him on Torquay beach'." Ferguson is coming to the end of his 23rd season in charge of United but insists that, despite his glittering record at Old Trafford, he will be criticised as heavily as any other manager if expectations do not continue to be met. "You just can't avoid it if you have a couple of bad results," he said. "Look at what's happening to Arsene Wenger at the moment - I find that incredible. "It's unfortunate but there's the culture in the media today that if you're not winning every game then 'swoosh', you're gone." Ferguson gained direct experience of that environment in 1989, when United fans marked the third anniversary of his arrival by unfurling a banner reading: "Three years of excuses, ta-ra Fergie." Ferguson described December of that year as "the darkest period [he had] ever suffered in the game". 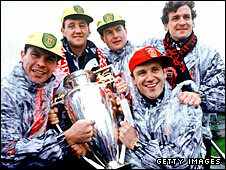 It was widely reported that if United had failed to win their FA Cup tie against Nottingham Forest in January 1990, he would have been sacked. But since then Ferguson has never looked back, guiding United to 11 Premier League titles, five FA Cups, three League Cups, one Cup Winners Cup and two Champions League triumphs. The reigning English, European and world champions are bidding to join Real Madrid, AC Milan, Liverpool, Bayern Munich and Ajax in the group of clubs to have won four or more European Cups. No team have yet retained the Champions League trophy and victory over Barcelona would see Ferguson's men become the first back-to-back European champions since Milan in 1990. Should they succeed there will be little left for Ferguson to achieve in club football, but the Scot claims his desire to carry on is as strong as ever. "It's not very difficult to motivate myself - I'm fortunate to be at a club, the right club, and that motivates me easily," said the former St Mirren and Aberdeen boss, who has taken charge of 1,907 professional matches and 1,274 as United boss. "The expectation of Manchester United is to win every game so it's very difficult to rest or take it easy in life and that suits my personality. "I've always had good players, which is also important because winning is the name of the game and if you don't win you're out of the job. "The expectation and the fear of losing helps you to be at the top end of your game all the time." Ferguson's approach to management has mellowed with age, his infamous hairdryer treatment and touchline histrionics largely a thing of the past. He identifies 1992-93 - when United ended their 26-year wait for a league title and became the first Premier League champions - as a defining moment in his tenure. "I think maturity brings out a different type of person and I've got far more intelligence than I had when I first started here," he said. "The best way to sum it up is that I'm in control. When I first came here I was never in control - you can't be in control of something when you're not winning. "Any coach who ever goes into a football club will never have control until he's successful. If you don't have the success then you may as well be on Mars. What do you think the score will be on what is bound to be a fantastic night on Wednesday? "I didn't feel in control until we won the Premier League for the first time. I knew it would open the door and that we would leap forward in every department because that was the millstone around everyone's neck. "We hadn't won it for 26 years and it was a burden. The previous year we'd lost it to Leeds, when four games in six days cost us the title - we should have won it. "But it's a funny thing, adversity. Some people thrive in adversity and I think this club is an example of that." Ferguson did not need to point out that United's victory over Chelsea in last season's Champions League final came on the 50th anniversary of the Munich disaster. Their manager at time was the legendary Sir Matt Busby, who would have turned 100 on the eve of Wednesday's final and continues to serve as a major inspiration to the club. Manchester United fans will display a huge pictorial image of their former boss when the team enters the pitch at the Stadio Olimpico. Busby, who was United's manager for 24 years until 1969, led them to their first European Cup triumph in 1968. 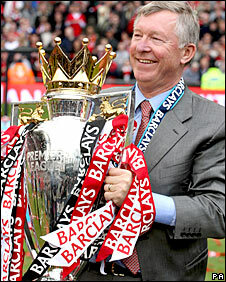 Ferguson and his players will hope to celebrate the occasion by delivering another trophy.